Who doesn't have fun when the learning activity is based on a game show? Based on "Password," students develop lists of sensory words that describe Thanksgiving-themed words and then pair up with partners who will use these "clues" to guess the passwords. 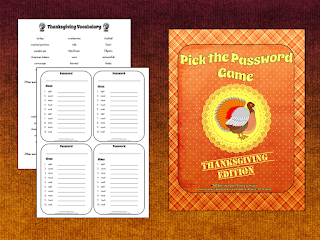 Pick the Password includes suggested uses, blank password clue lists, possible Thanksgiving vocabulary to use as passwords. It also includes links to lists of general sensory words for sight, sound, taste, touch, and smell.